Khao khluk kapi (Thai: ข้าวคลุกกะปิ, pronounced [kʰâːw kʰlúk kāpìʔ]; sometimes spelled as khao kluk kapi) is a flavorful dish in Thai cuisine that consists of primary ingredients of fried rice mixed with shrimp paste, the latter of which is known as "kapi" in Thai. The dish is typically served with several side dishes or toppings, such as sliced cucumber, sliced shallot, onion or purple onion, deep-fried or fried shrimp, shredded or thinly sliced sour green mango, chili peppers, deep-fried chili peppers, sliced thin egg omelet or crêpe, sweetened roasted pork, pork belly (Chinese mu wan), Chinese sausage such as kun chiang, and mackerel, among others. It has been described as a salad dish per the vegetables that accompany the dish, and as possessing the flavors of saltiness per the shrimp paste, sweetness per the fruits, and spiciness, per the chili peppers. 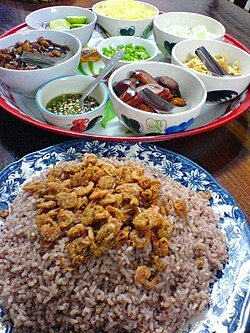 Khao khluk kapi originated in Central Thailand, and it is typically served as a lunch dish in Thailand. Foreign visitors to Thailand may not be aware of the dish's existence. ^ a b c "7 món cơm bình dân nhưng ngon 'không chê vào đâu được' của châu Á". Việt Times Australia (in Vietnamese). April 6, 2017. Retrieved April 25, 2017. ^ a b Ferber, Lawrence (March 7, 2016). "The One Thing Visitors to Thailand Should Know About Ordering Food". CNT. Retrieved April 25, 2017. ^ a b c d e Bush, Austin (January 4, 2010). "Khao khluk kapi: The best Thai dish you've never heard of". CNN Travel. Retrieved April 25, 2017. ^ a b Philpott, D. (2016). The World of Wine and Food: A Guide to Varieties, Tastes, History, and Pairings. Rowman & Littlefield Publishers. p. 452. ISBN 978-1-4422-6804-3. ^ Journal of the National Research Council of Thailand (in Thai). The Council. 2003. ^ a b "Gallery: 10 Overlooked Thai Dishes in Chicago from Leela Punyaratabandhu of 'SheSimmers': Serious Eats". Serious Eats. April 20, 2017. Retrieved April 25, 2017. This page was last edited on 10 April 2019, at 23:17 (UTC).